As soon as Nintendo's E3 session began, The Legend of Zelda: Skyward Sword made it's debut. As ever, Shigeru Miyamoto was there to showcase the game, this time appearing weilding a sword and shield. After a brief message from Miyamoto which informed fans of Skyward Sword's integration with the new Wii Motion Plus technology, it was off to the stage to play the game. Arguably, Skyward Sword's graphics are the most unusual we have ever seen for a Zelda game. They appear to be a cross between the cel-shaded, cartoon style of The Wind Waker and the more 'realistic' graphics of Twilight Princess. However, it should be noted that the possible stylistic influences of Skyward Sword do not necessarily translate to the technological aspects of the game. Shigeru Miyamoto commented on the graphics, calling them 'impressionistic' and like a 'moving painting' as opposed to being cel-shaded. Problems of classification aside, the graphics look very pretty. In particular, the environments look very colourful and vibrant. Many of the old mechanics of Zelda have been revised, thanks to Wii Motion Plus. Most importantly, you get to control the sword as if you were weilding it in real life, and the direction you swing the sword will be mimicked on screen. There is no doubt that the increased amount of freedom this brings to sword fighting will offer a greater depth and breadth of swordplay tactics. The same goes for using your shield, and you can even bash enemies with your shield by using the nunchuk. Of course, the Wii Motion Plus is not just limited to melee combat. You will be able to throw bombs by aiming the controller, shoot arrows, and so on. The use of a new item was demonstrated as well. 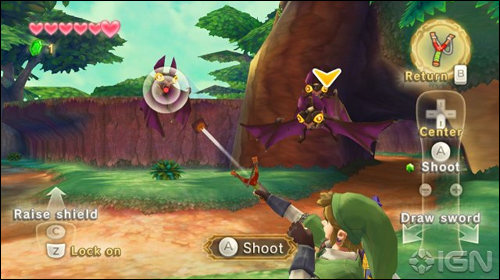 At some point in the game, Link will gain access to a flying beetle. This mechanical beetle can be aimed with the wii controller (similarly to the hookshot), and pressing the button will launch it. From there, you are free to control it like it were a remote control helicopter, and it will hopefully make for some interesting puzzles. 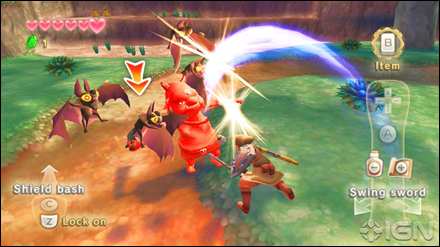 For instance, in the Skyward Sword trailer, we see Link launching the beetle into a bomb flower. The beetle then carries the bomb over to a crack in the wall to explode it. A whip is also obtainable in the game. The item is moreorless lifted from Spirit Tracks, but it's capabilities have once again been extended with the Wii Motion Plus system. The whip will be used to defeat enemies, but it is likely to also allow Link to grapple onto things (such as a tree branch) and swing from them. The stage demonstration of Skyward Sword was a little disappointing. Throughout it, Shigeru Miyamoto was controlling the game, but he ran into some difficulties. When demonstrating how to throw a bomb, it took numerous attempts (and many flicks of the wii controller) to finally pull it off. Miyamoto also experienced similar problems with the bow and arrow. This was attributed to various wireless 'interferences.' Apparently, the booths available for players to play Skyward Sword were well recieved, with the controlls being easy to handle and very accurate.